ast Casual Dining (or what we call “Eat-in Takeout”), our original concept lives on – now with 4 great locations to serve you in Waipio, Koko Marina, Kailua town and now open in historic Haleiwa on the North Shore! Always featuring local plate-lunch favorites as well as daily gourmet specials. It’s hotel quality food in a white foam box. Of course, dine-in is always available at all Fatboy’s Plate-Lunch locations. 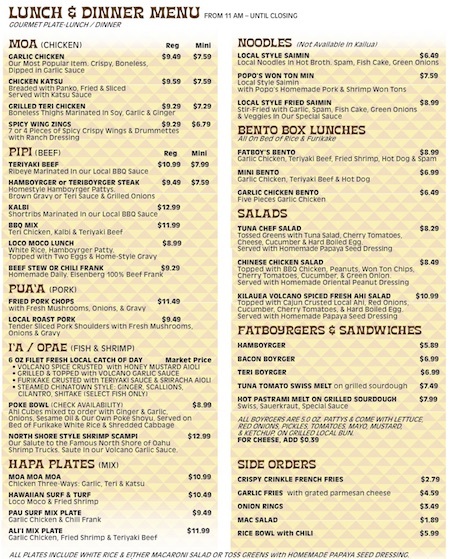 The unique menu at Fatboy’s Haleiwa has a few of Hawaii’s most favorite plate-lunch items, including several local fresh fish choices – prepared in 4 ways! 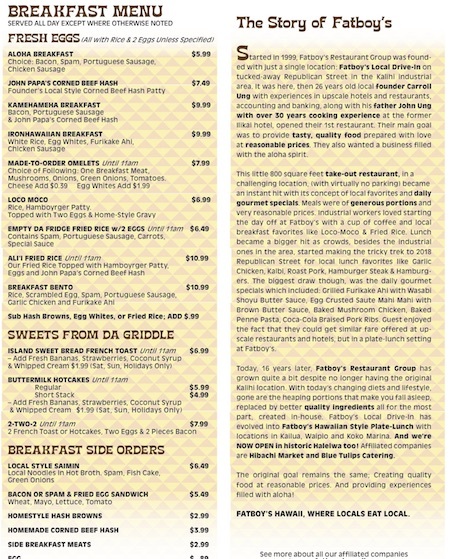 Menu items showcase local products mostly from right in the North Shore and Oahu area! Serving Breakfast, Lunch, Dinner, and Cocktails. Call in your order and have it ready for pick up. Or enjoy our modern country decor and large outdoor patio. *** Please note that Menu prices may vary by location.